Your Company Needs a Vector Logo! Your company's logo may be a work of art, but if it's not in vector format, you are asking for trouble. This article explains the advantages of converting your current logo to vector format. 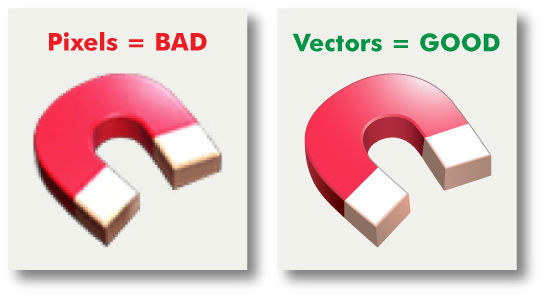 A vector file represents an image using precise mathematical terms, not sloppy pixels. Vector logos can be enlarged, shrunk, re-colored and edited without causing the degradation that is so common with pixel-based graphics. (More Info) Download the PDF file that is linked below the sample images to see for yourself. Sign makers and most commercial printers require vector files for printing. Vector files are also ideal for use as a source for web graphics. If you can't supply a vector image, you will be hit by expensive art charges. Most vendors won't supply the vectorized art to you, so this can be a recurring cost. Some vendors use automated software to vectorize your images, which will result in a less-than-ideal result. It is vital that a human, not an automated computer program, is in charge of redrawing the logo. Only a human can understand how your logo is supposed to look. Unlike most pixel-based files, vector graphics can encode specific color information that your printer may need to reproduce your logo correctly. Generally this information is coded using the Pantone Matching System, and most pixel-based files are incapable of communicating this information. How do I know what format my current logo is? These files can also contain pixel-based images. Send us an email or request a free conversion quote, and we'll let you know for sure. Which Vector Format is the Best? PDF format is often recommended because it can be opened without expensive software and is welcomed by commercial printers and graphic artists. Note that PDF files can also save pixel-based information, and this is what you will get if save your pixel-based logo in PDF format. EPS format is also popular with many printers, especially those who rely on older software that cannot import the newer PDF format. Lizardfish Graphics is a leader in the vectorization industry, and has converted thousands of logos for companies around the world. Many of the world's best printers rely on our services on a daily basis. Receive a no obligation price quote for converting your logo to vector format. Pricing for logo vector conversion starts at $15. catalogs and labels, for all the same reasons.